1. (+) Cinder, the protagonist - snarky and strong but realistic. I loved that this book was more of a story of Cinder coming unto herself than anything else. It made me like her much more as a character too to see her struggling with what she is. Also, her strength is to be admired, because even though she goes through some incredibly tough situations, she doesn't break down. She also doesn't do anything immature even though she's clearly provoked by the stepmother. A teenage protagonist for the older crowd. 2. (+) The World-Building - loved the world-building! Lunars vs. Earthens and the Lunars's powers as well as their government and history, leutomosis and the research facilities, the ID chips, New Beijing and the market place, the emperor and the traditions, the way the Earthen government became the Union... I want to know more... particularly how the Lunars became so cruel. 3. (+) The Romance - it was nice, and I liked that the Prince seemed to like her for she who is and her mechanic tendencies, and I enjoyed them having their little chats--the Prince talking a lot about what's going with the realm... but I think I would've liked more of an explanation. Cinder is "easy to talk to," yes, but that's not unique enough for me. I want to hear more from Prince Kai. For one, it almost seemed unprofessional of him to be telling Cinder as much as he did. I get that he's not that old yet and hasn't really led anyone, but he surely should know that revealing that much isn't right. And secondly, of all the things to say about Cinder, he says "easy to talk to?" There must be thousands of girls who chase after him; I doubt that he can't find another one who's also easy to talk to.... But I really liked Kai as a romantic lead and since this is the first book and Meyer is setting up the romance for the next three books, I thought that she did a pretty decent job with it. It seems like it'll be slow-burning romance and happily it was not one based on love-at-first-sight or anything like that. 4. (--) Character Stereotypes - I know it's a fairy tale and she's following it but she didn't need to make them so much like the stereotypes... the stepmother and stepsister really bothered me - they were clearly cut from the fairy tale, and honestly they didn't seem like real characters/people to me because of that. 5. (--) Not Enough Reflection - There was a part of me that wondered why Cinder could still feel emotion. First off, it's the first cyborg book I've ever read... and secondly, when I saw how much machine invaded the human, I thought... well... why? Are there ever times when she can't feel emotion? She can't blush or cry and there are temperature controls and whatnot, but I wanted to know more. How does being a cyborg affect her? Is it really just the inconvenience and the second citizen-ness? (And something else which I won't spoil for you)... Other than that, Cinder's perfectly normal? No super strength or? 6. (+) The Take on the Fairy Tale - That was a pretty funny take on Cinderella's ball and the lost slipper. I didn't completely see that one coming. Really loved the ball scene in general. 7. (+) Predictability - In this case, I think the predictability worked for Cinder. It was obvious what the big reveal was going to be, but the tension of not knowing how that would fit in this new mold carried me through the novel. If you're someone, though, who gets annoyed with knowing what's going to happen, maybe this isn't the book for you then. 8. (+) Pacing - Pretty fast-paced and enjoyable to read because of that. Book was split into four parts but each part was appropriately paced. 10. (+) The Cover - Captures both the essence of Meyer's take on Cinderella and the original fairy tale. 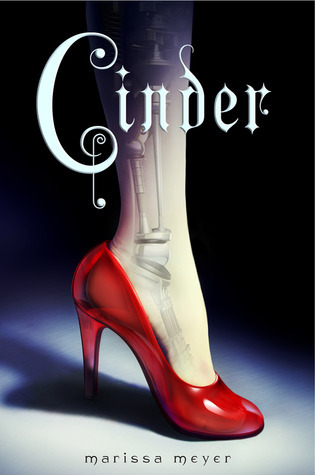 I really loved Marissa Meyer's world-building, and all in all, Cinder was a fun spin on a classic fairy tale. I'll likely keep my eye out for the sequel and recommend this book to all fairy tale lovers. I always love, love, love your review style! Totally agree about the romance. I liked Kai, and I liked Cinder, but together? I'm not sure. I don't understand what Kai sees in Cinder specifically that he would do...everything he did. I liked that the author gave the stepmother more motivation than just "evil stepmother syndrome." I think a lot of her nastiness came from her grief over losing her husband. I'd like to know more about their history together. I imagine she might have been a very different person before his death. He seemed like a good guy and I couldn't see him marrying her if she was that nasty. Well. I won Cinder on this website. I really wanted to read it, Thinking its like a tomboy version of Cinderella. It sorta was, but to me it was even more than I expected. I read it in a whole day because it was so addicting and awesome. I love how Prince Kai its so determined to be able to get Cinder to go to the ball with him. I was so angry when Kai imprisoned her. But it was so awesome and I just cannot wait until the next book. I really cant wait! its that addicting! P.S Kai sounds like a perfect boyfriend for me. Sweet, protective. Etc. I just love him! I didn't read this for a long time, despite great reviews, because I thought the whole cyborg element would be too out there for my tastes. I'm really glad I gave in and read it, because I enjoyed the book so much! I can't wait for Scarlet to come out. I thought the cyborg element mixed with the fairy tale is a pleasant change from other fairy tale books. The stepmother and sister really bugged me in this book so much that I wanted to kill them! I can't wait to see what happens in Scarlet.